invited for filling up 21 Stenographer Vacancies in NCLT at different Locations. Preference will be given to the Retired Govt Employees. Minimum qualifications required for Stenographer Jobs is Graduation with 100 WPM speed in English Shorthand. Eligible candidates need to download the application format from NCLT official website. Submit the application for the post Stenographer before 27th November-2017. Candidate need submit separate application forms for each location. 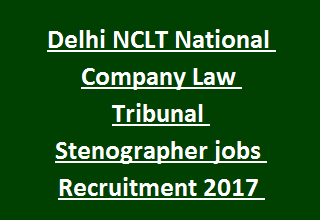 NCLT Stenographer Recruitment selection is based on Skill Test in English Shorthand and followed by Interview. Applicants are required to submit original certificates along with attested copies of certificates/ testimonials in support of DOB, Educational Qualifications & Experience etc. for Verification. Pay Scale for Stenographer Jobs is Rs. 45,000/- per month. More details regarding Application process/ filling procedure, Selection method, Age details, Qualifications, Age relaxations for National Company Law Tribunal, NCLT Stenographer Recruitment 2017 are stated below. Last date to receive NCLT application forms: 27-11-2017. Total vacancies available in National Company Law Tribunal NCLT Recruitment are 21 posts. Post Name: Stenographer: 21 posts. i. NCLT, New Delhi Bench: 05 posts. ii. NCLT, Ahmedabad Bench: 04 posts. iii. NCLT, Chennai Bench: 02 posts. iv. NCLT, Kolkata Bench: 02 posts. v. NCLT, Mumbai Bench: 08 posts. Candidate must have Graduation qualification in any discipline from recognized University. Must have 100 words per Minute speed in English Shorthand. Monthly Pay Scale for Stenographer Jobs is Rs. 45,000/-. Allowances admissible as per rules. Check the NCLT Notification for Age limit, relaxation details. NCLT Recruitment Stenographer Jobs selection will be made on the basis of candidate skills in Interview. Only qualified candidates in Skill test in English Shorthand are allowed for attending Interview. Applicants are required to submit attested copies of certificates/ testimonials in support of DOB, Educational Qualifications & Experience etc. and original certificates for Verification. Interested candidates willing to work at NCLT may download the application from National Company Law Tribunal recruitment page and submit application in prescribed format on or before 27-11-2017. Room No. 614, Block No. 3, C.G.O. Complex, Lodhi Road, New Delhi, Pin- 110 003.